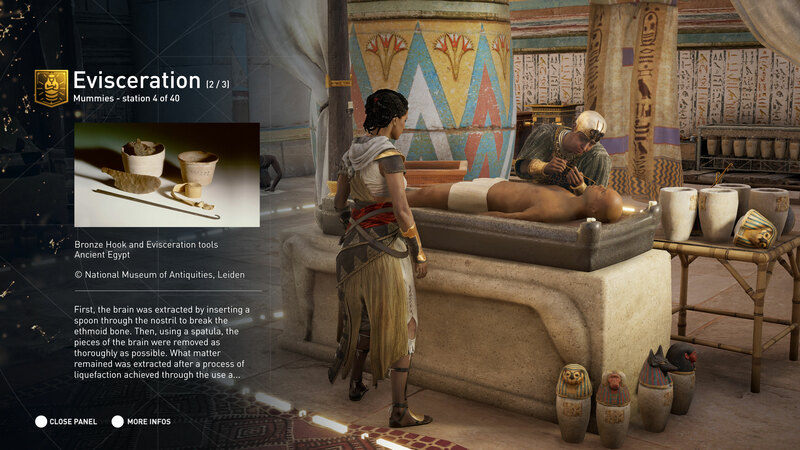 Remove the Assassin/Templar storyline and Assassin's Creed games can be quite the educational experience and it looks like Ubisoft has realized this with a new feature set to debut in Origins. The Assassin's Creed series has lasted as long as it has partly for its fiction, partly for its stealth gameplay that allows players to hide in the shadows, but also in great part because of its looks into ancient history. Throughout the series, Ubisoft has strived to be faithful to the various Assassin's Creed historical settings by offering fun historical facts and aiming for accuracy in regards to the game's architecture. Now it looks like Ubisoft is fully embracing the educational potential the AC series has to offer. Wednesday morning, the Ubiblog offered a peek at Assassin's Creed Origins' new Discovery Tour mode. This is a completely combat-free game mode and focuses entirely on the ancient Egyptian time period, essentially creating an interactive museum. Discovery Tour will feature dozens of interactive tours, all curated by historians and Egyptologists. It's Ubisoft's attempt to push forward a recent trend of using video games as an educational tool, joining such games as Minecraft and Kerbal Space Program. Creative director Jean Guesdon cites an interactive Egyptian mummification process as an example of something teachers can use in the classroom to offer new insights to their students. Unfortunately, the Discovery Tour feature won't be ready for Assassin's Creed Origins' launch. It's being estimated for an early 2018 launch as a free update. Assassin's Creed Origins hits PC, Xbox One, and PlayStation 4 on October 27. Is it weird that this is the first time I've been intrigued by an AC game?